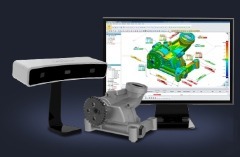 3D Systems / Geomagic Solutions recently introduced a family of powerful, integrated scanner and software systems for professional Scan-Based Design and quality inspection. Capture is available in six application-specific configurations, combining the best of Geomagic software with a compact, ultra-precise blue light LED scanner. This amazing technology captures almost one million points in 0.3 seconds to create detailed models of physical objects, accurate to 0.060-0.118 mm.